* Event handler for clicking on button "Connect"
* Event handler for clicking on button "Disconnect"
A simple HTML 5 page is used here to create a form for connecting to a WebSocket server endpoint and for exchanging messages. The HTML page uses the wsclient.js script shown earlier and is shown in the screenshot below. To run this HTML file, open it in a browser, such as Google Chrome by selecting File > Open. To connect to this WebSocket server endpoint, a URL like the one below is used. Open the wsclientform.html shown earlier in a web browser and enter the required WebSocket connection parameters as shown below and then click on the Connect button. If the connection was established successfully, the button will be disabled and the Disconnect button will be enabled. The Google Chrome Developer Tools is a good tool for examining WebSocket connections. In the Developer Tools window, switch to the Network tab and select WS to view a list of all WebSocket connections for the current page. 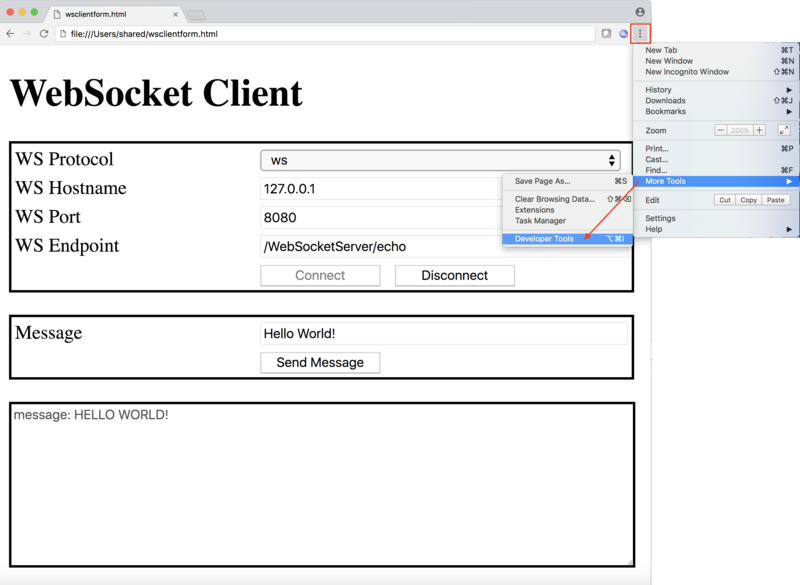 Click on the Header tab to view the WebSocket connection request- and response headers. The Frames tab lists all outgoing and incoming messages. In the below screenshot, the first message is the one that was sent from the client to the server and the second message is the server echo in uppercase characters. The Timing tab shows for how long the connection has been open. Since a WebSocket is a persistent connection, there is a message saying: CAUTION: Request is not yet finished. The readyState property of the WebSocket object stores the status of the connection. A value of 1 means that the connection is open and ready to receive and send messages. 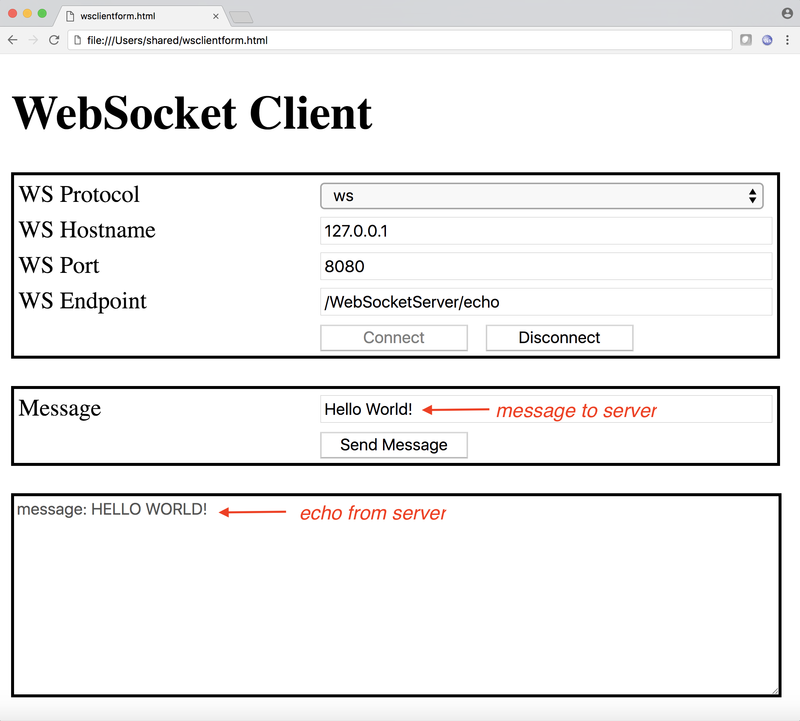 It can be used to check the WebSocket connection before attempting to send a message. If the connection is closed, automatic connection opening retry logic could be implemented. 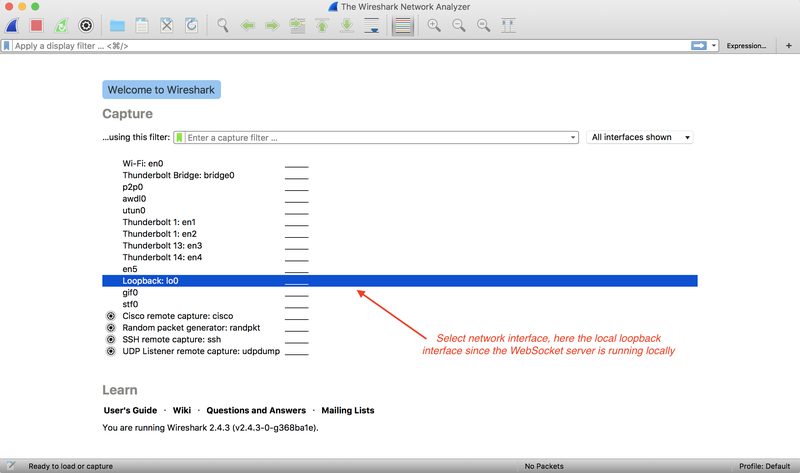 Wireshark is a very comprehensive and useful tool to monitor traffic on a network. 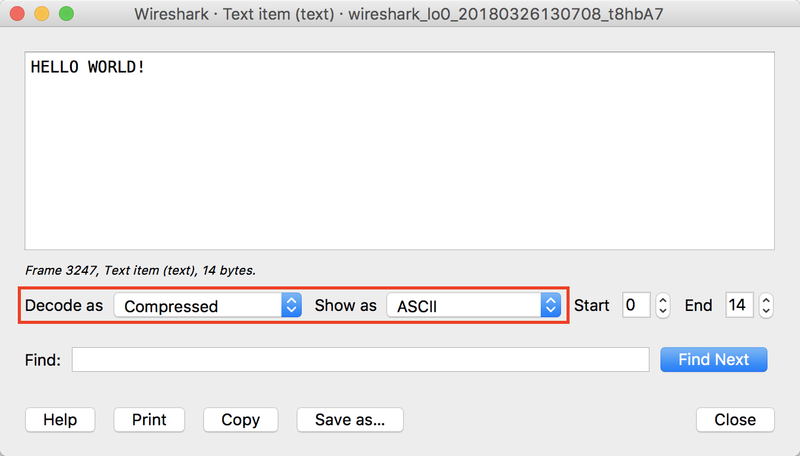 It can be downloaded for free from www.wireshark.org/download.html. After the installation, run it and select a network interface on which to capture traffic. To only view WebSocket traffic, enter websocket in the filter field. 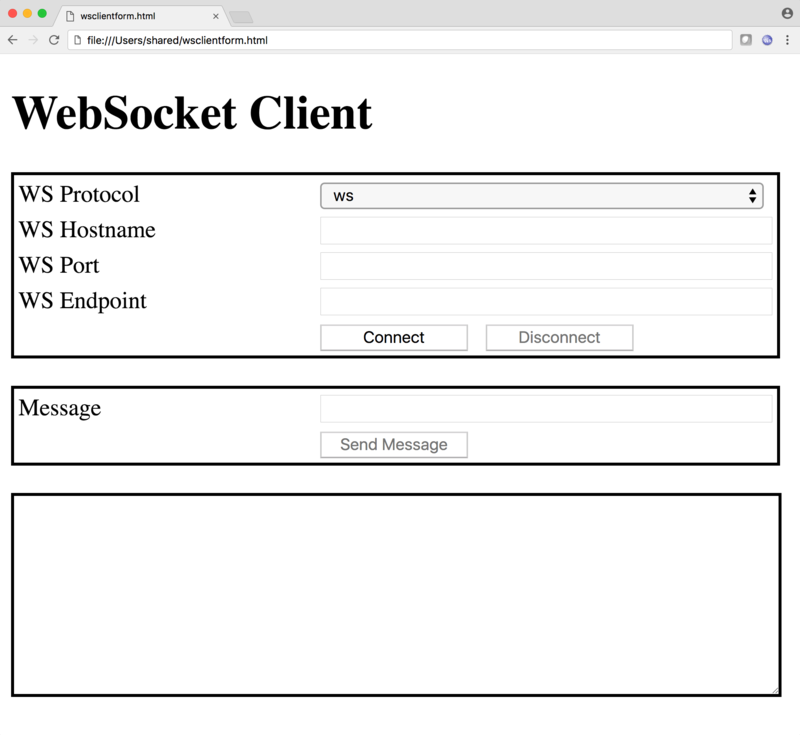 Click on a frame to examine its contents, including the actual payload of the WebSocket message. Scroll down to the Line-based text data node and expand it. Right-click on the compressed payload and then select Show Packet Bytes. In the dialog window, select Compressed from the Decode as dropdown control to view the payload in plain text. 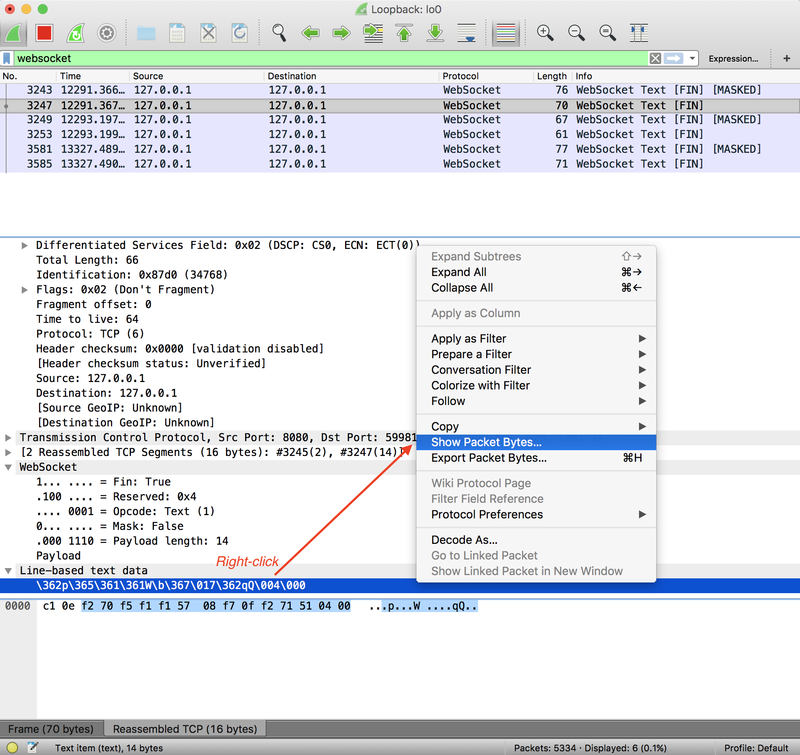 For additional information on using WireShark to monitor WebSocket traffic, see https://wiki.wireshark.org/WebSocket.